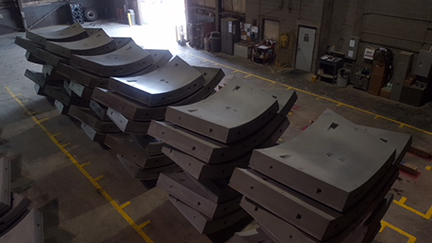 April 1, 2019 -- View of iner pieces #2 and 3 are attached. These are the precast concrete ppieces we tshowed in earlier photos. Once attached, they have an inside diameter of approx. 16-feet. 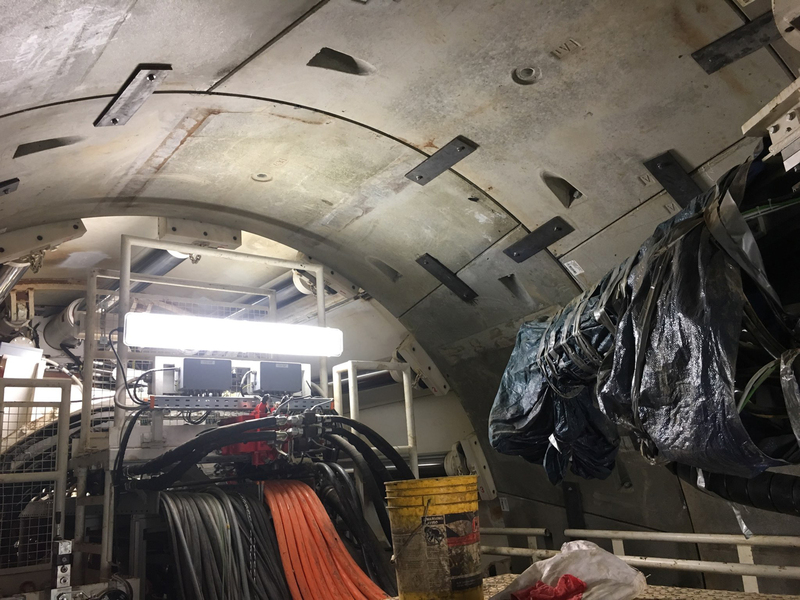 March 27, 2019 - Photo below shows first liner pieces being connected. 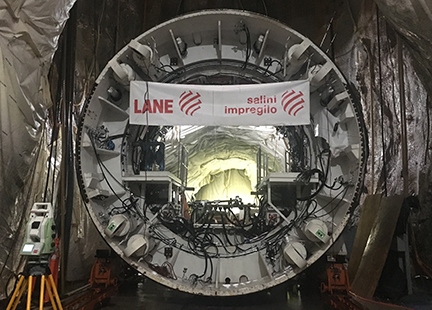 Crews are working in the Tunne Boring Machine. 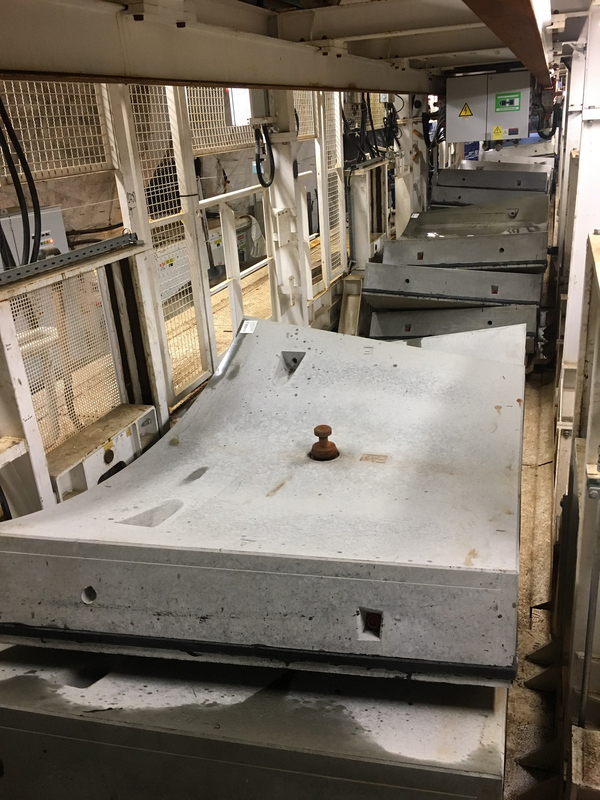 March 20, 2019 -- Photo below shows the gantries placed in the pump station area. The pump station is just east of the working shaft where parts of Mamajo are already connected. Gantries house the segment feeder to transport the concrete liner pieces forward for installation. Gantries also house the slurry pump, control cabinet, the bentonite supply system and hydraulic pumps. 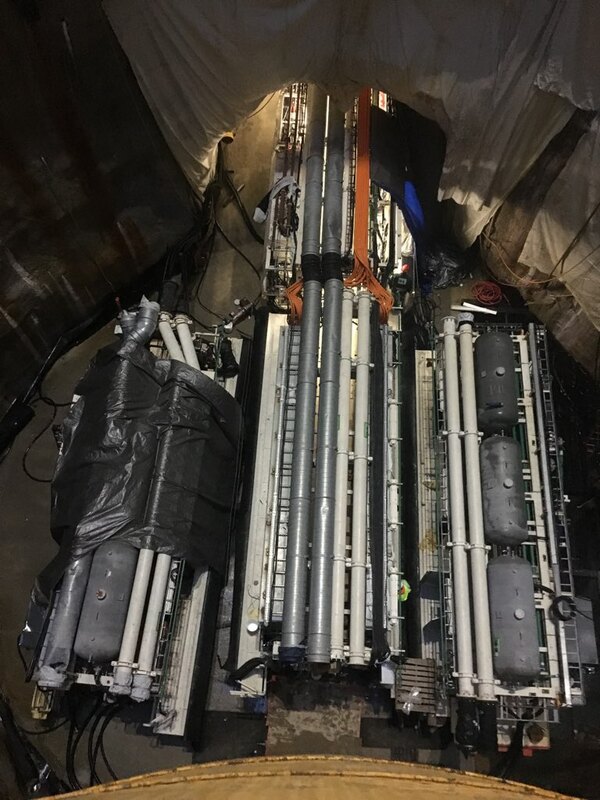 March 12, 2019 -- Photo below shows three parts of Mamjo connected and preparing for the five mile journey. 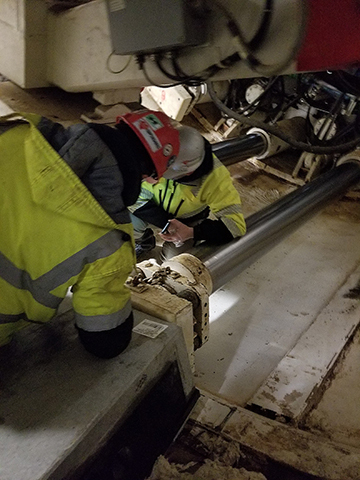 February 11, 2019 - Last week two pieces of Mamajo were send down the working shaft. The photo below shows the machine after some of the connections were placed. December 18, 2018 -- Work continues on getting Mamajo ready to dig. 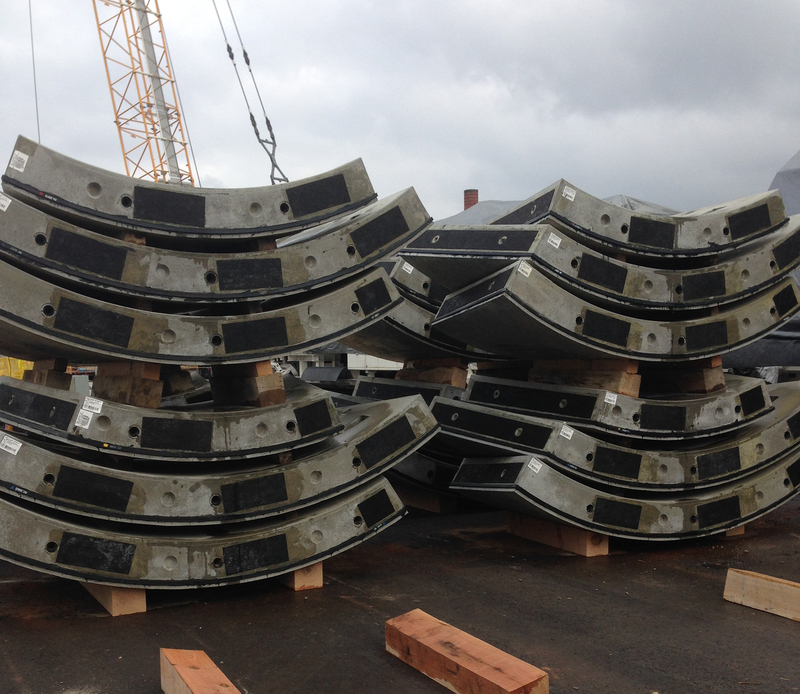 This photo shows the concrete linner pieces that will be instlaled as Mamajo progresses. 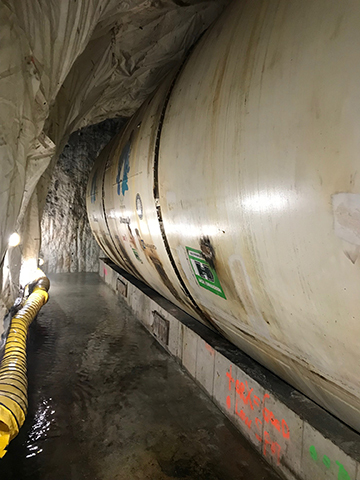 The 5X7 foot pieces connect to become the tunnel liner. 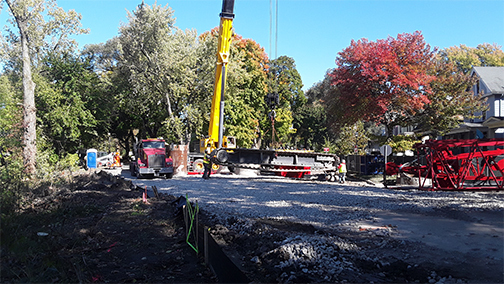 October 25, 2018 -- Work continues at the working shaft and pump station shaft as well as the neighborhood drop shafts. All but one of the drop shafts are under construction. This photo shows the equipment in place at the intersection of Berry and Thieme. September 10, 2018 -- A message from MamaJo: "Thanks to all of you who came out to meet me on Sunday, September 9 -- and gosh there were a lot of you. I'll NEVER remember all your names. You might have had to wait a long time to see me, but I hope it was worth it and that you didn't get too cold. I've heard it can get really cold here in the winter so I'm looking forward to going underground before winter weather hits. If you had your picture taken with me, please click here to download photos. Our photographers are uploading the photos today and it may take a little time, so please be patient. Thanks again for visiting me and I'm looking forward to keeping you updated as I prepare for my undergound journey." September 7, 2018 -- MamaJo is ready for visitors on Sunday May 9 from 11 a.m. to 3:00 p.m. The tour takes about 35 minutes. Please -- no flip-flops. The tour will be by trolley with three stops. It takes about 35 minutes. Parking is in front of the Pollution Control plant near the trolley boarding area. August 31, 2018 -- Tour MamaJo on September 9. Crews are working to get her ready for your visit. Also, crews are busy working on drop shafts near Headwaters Park West and near Guildon park. Clik on the links to view videos. 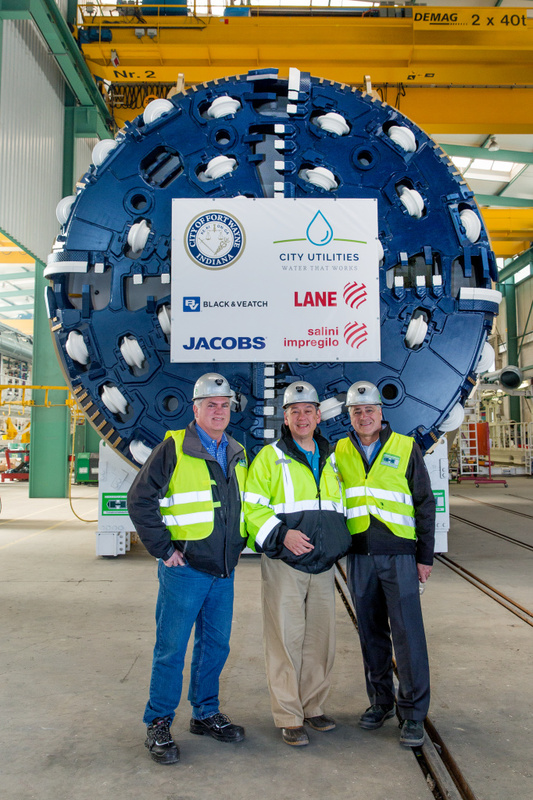 August 7, 2018 - Today City Utilities unveiled the name for the 400-feet long Tunnel Boring Machine – MamaJo! Voting was cast earlier this year and the name, MamaJo won with more than 43% of the vote. In addition, you will be able to see MamaJo in person! On Sunday, September 9, from 11:00 a.m. to 3:00 p.m. at the working shaft site near the intersection of Dwenger and Glasgow Avenue, City Utilities will be hosting tours of the site. More information to come. 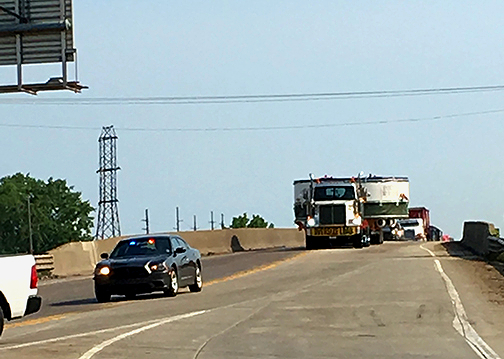 July 11, 2018 -- Work will begin next week at the drop shaft just south of the Maumee River at River City. 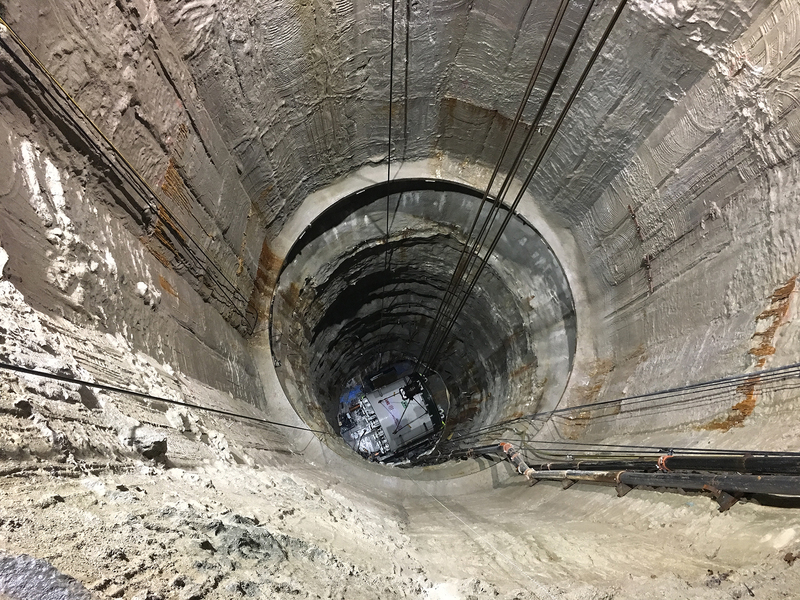 The working shaft is about 180 feet down and the Pump Station Shaft 160 feet down this week. 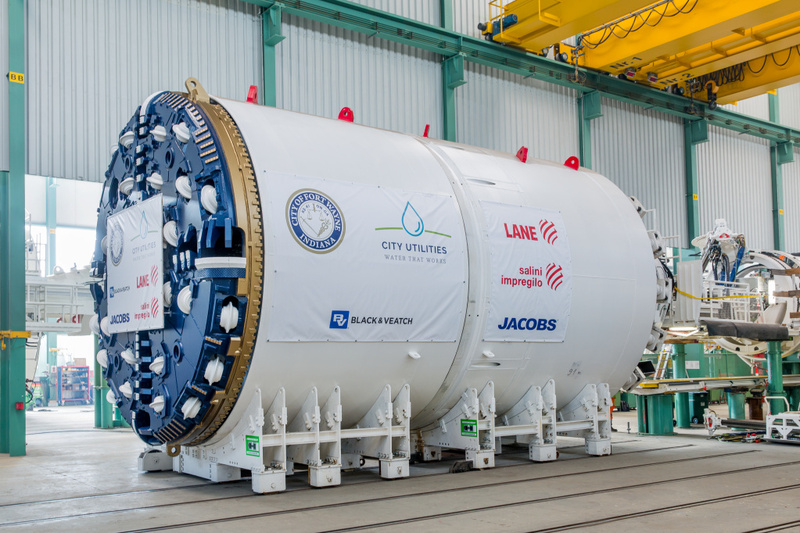 Click on this link Cutterhead in action -- to see the Tunnel Boring Machine being tested at the manufacturing plant in Germany. 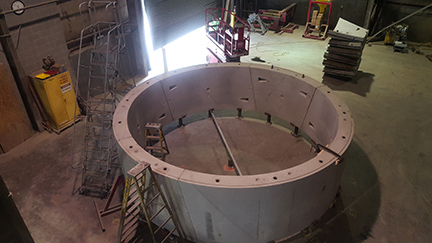 June 29, 2018 -- Tunnel segments were constructed to build the first test ring for inspection. This will be the 1-foot diameter interior wall of the tunnel. 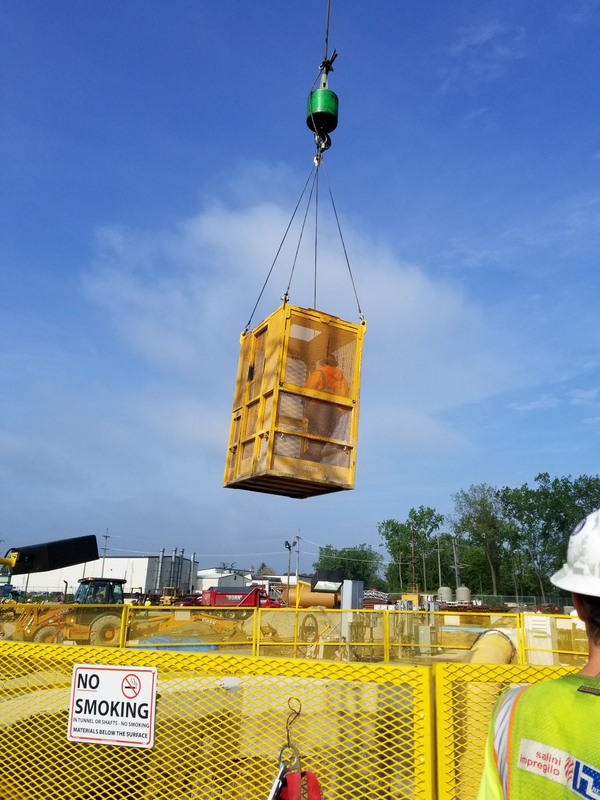 June 22, 2018 -- Progress continued at the two neighborhood drop shaft sites and at the working shaft sight. Late in the week, heavy-rain slowed the project. Click for aerial view of work near Water Pollution Control Plant. June 8, 2018 --The working shaft and the pump station shaft are progressing on Dwenger Avenue. The working shaft is at about 130 feet and pump station shaft is about 120. Click on this link showing aerial video of the progress. The Drop Shaft on Brown Street is under construction. 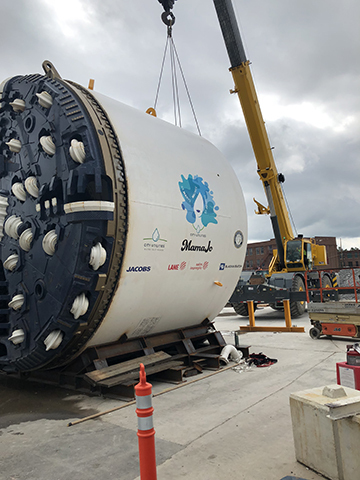 Click to see the 50-ton, 70-foot casing at Brown Street. It will collect combined sewage and drop it to the tunnel -- keeping it out of the St. Marys River. Work at Foster Park will begin again in September. Equipment being used at the Pump Shaft will be moved to Foster for that work.